Leadership includes the ability to persuade others to embrace one’s ideas and to act upon them. Teaching law students the art of persuasion through advocacy is at the heart of legal education. But historically law schools have not included leadership studies in the curriculum. This book is one of the first to examine whether and how to integrate the theory and practice of leadership studies into legal education and the legal profession. 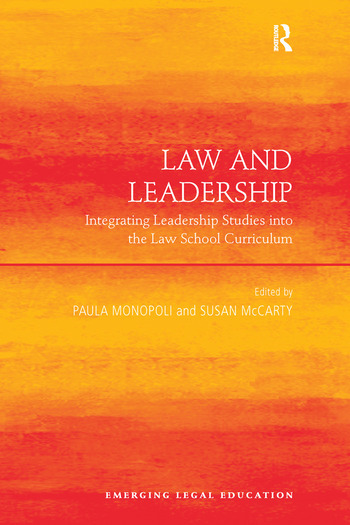 Interdisciplinary in its scope, with contributions from legal educators and practitioners, the book defines leadership in the context of the legal profession and explores its challenges in legal academia, private practice, and government. It also investigates whether law students need to study leadership and, if they should, why it should be offered as part of the curriculum. Finally, it considers how leadership should be taught and how it should be integrated into classes. It evaluates new leadership courses and the adaptation of existing courses to reflect on how to effectively blend law and leadership in doctrinal, clinical, and experiential classrooms. The book includes a foreword by Pulitzer Prize-winning historian and noted leadership scholar, James MacGregor Burns and a foundational essay by prominent leadership scholar and one of the founders of the International Leadership Association, Georgia Sorenson. It will be a valuable resource to anyone interested in leadership, education policy and legal ethics. Paula Monopoli is Professor of Law at the University of Maryland School of Law. She is a graduate of Yale College and the University of Virginia School of Law and she is an elected member of the American Law Institute. Professor Monopoli also founded the School of Law's Women, Leadership & Equality Program in 2003. Susan McCarty is Senior Research Fellow at the University of Maryland School of Law. She is a graduate of Wellesley College and the University of Maryland School of Law, order of the coif. As Senior Research Fellow, McCarty edits and prepares faculty books and articles for publication.